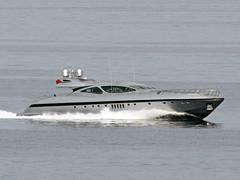 I call Dan O'Neill at Yachtzoo about their new central agency for sale, Mangusta's 39.5m superyacht Awesome_ and he asks me to mention that she's available for viewing at next week's Monaco Yacht Show on berth T17. _Awesome was built by the Overmarine yard in 2005 and accommodates up to 10 guests in a full beam master, VIP, double and twin and cruises at 31 knots. With a motivated seller, she's currently asking €12.8 million.